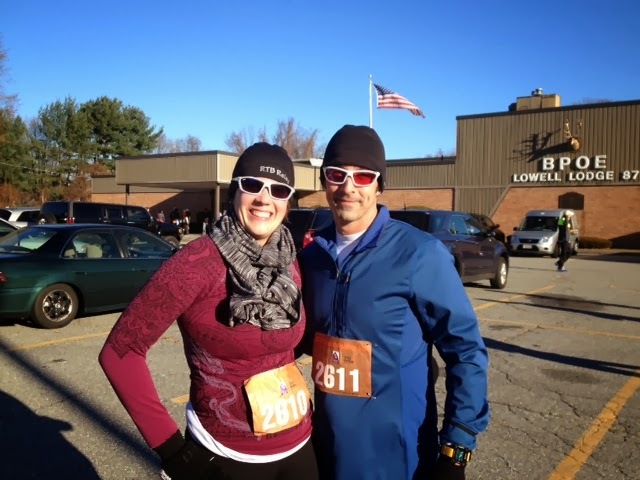 Another Thanksgiving which means another Turkey Trot. For the last few years we have run the local 10k and this year wasn't going to be any different. I had texted my friend and team mate from Luna Chix, Lisa to come out. How many people can you text at 11pm to come run the next morning at 8 in the freezing cold and they'll actually show up?! Even though D didn't feel like running when we got up. We hopped in the car and headed to the race. A couple years ago it was in the 50s on Thanksgiving. This year it was a FRIGID 20 something with 50mph wind gusts. I think it was the howl of the wind that made D not want to go out to run. To be honest I wasn't too excited either. I had spent the last week doing any workout that wasn't swim, bike or run. I had only run 2 miles the week before. 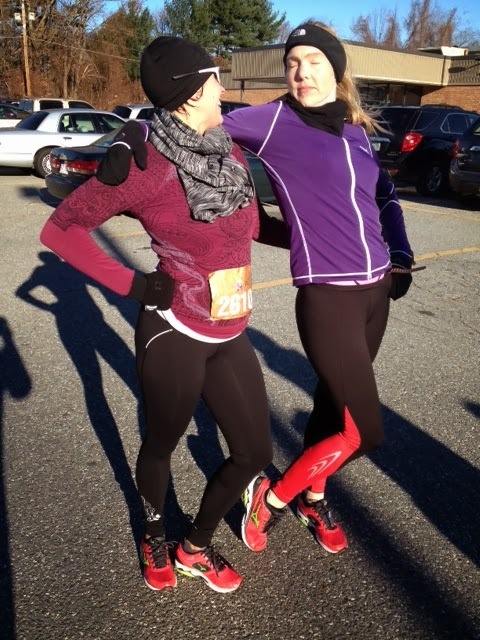 This 10k was going to be interesting and COLD! Lisa being from Minnesota thought we were wimps. We headed to the start line and tried to hide behind cars to block the wind. So much for 8am start time. Come on we are getting really cold. We stood in the mass of humanity singing the national anthem and suddenly before it was over, the group surged. WAIT?! what?! We aren't going to finish the national anthem? 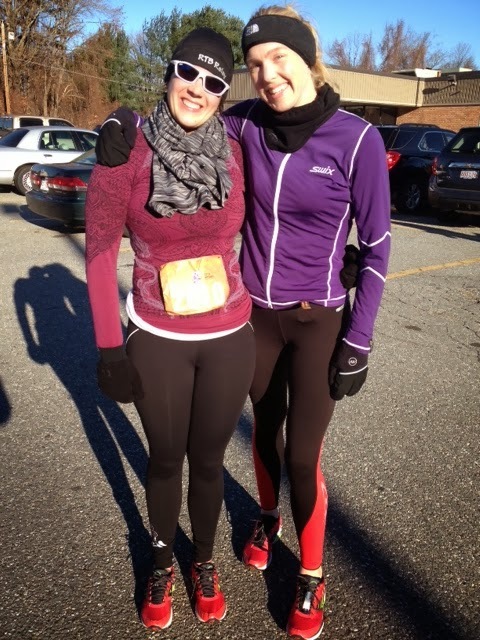 Turkey Trot is the best place to end up with people lined up on the start line that don't belong there. Look if you aren't going to run a sub 20min 5k move back! Walkers just put yourself in the back! It is chip timed. I laughed and told Lisa luckily I am not going for a PR. D buzzed off and we joked that we would see him as he did his second loop. The first part of the course was a lot of dodging the 5k runners that seeded themselves in the wrong spot. And to be honest- I know better I could have saved myself and put myself up closer to the front. The first couple miles were uneventful. A bit slow with all the weaving. Then we turned the corner the river is to the left and the wind started to howl. It was so bad you couldn't even get enough of a full breath. I pushed but it felt like I was going backwards. Then luckily the second loop takes you out of the wind again for a couple miles. We crossed at 55:50. And my time from last year was a 58:30 so I crushed the course. And even running and chatting with Lisa, being pushed around by the wind, and I ended up 4 min away from my 10k PR. We had fun taking pictures after then headed home. D and I were planning on having "his" thanksgiving- Dutchgiving. 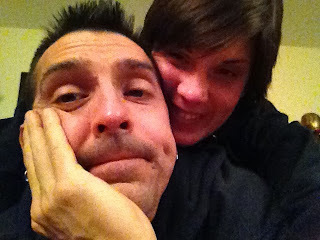 We laid and watched the Macy's parade and hung out with no place to be and no timelines. Got up and watched football and warmed up our turkey pot pies from the local farm. 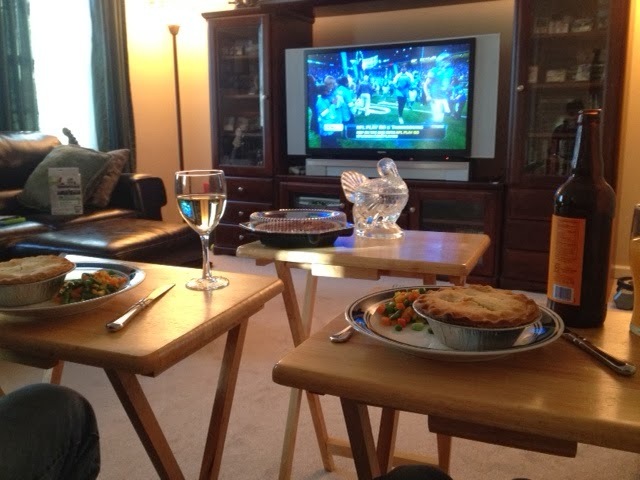 We ate the pot pie and pecan pie and even fell asleep watching football. It was a really nice relaxing holiday! If you have never had a relaxing holiday I highly recommend it. Sitting around with no one else's timeline or stress or pressure was really nice!